The talented parents that visit us have some pretty pink princess theme nursery ideas as well as some tips on decorations that you can make yourself for your baby girl's room. Imagine growing up in a nursery surrounded by a mural featuring a fairy castle in the clouds just like the ones in the storybooks where a little girl can wear Disney princess costume and crown every day if it tickles her fancy. Every baby girl deserves to be treated like royalty and to have fond memories of her special room. Finding the perfect princess crown and a pretty set of princess crib bedding is crucial, so let's get started! 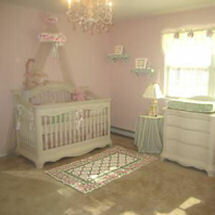 The crown over her crib was the first for the baby girl that occupies this pretty room. The roses that embellish the crib crown add a feminine, romantic atmosphere and a touch of sage green to the soft pink and cream color scheme. Go here to see more items that can be used to decorate princess nurseries in a pink and white color scheme. Neutral shades of gray or brown may be added for balance. Use the colors that are included in the fabric of your crib set as your guide. Taking your decorating cues from the fabric's color and pattern will help you to make important decisions such as what color to paint the nursery walls and what your accent colors should be. A princess castle nursery mural complete with colorful, hot air balloons painted by a loving grandmother is the focal point of the room. The colors included in the painting are the perfect background for baby's changing area. There are inexpensive, less time consuming options for decorating the walls, as well. 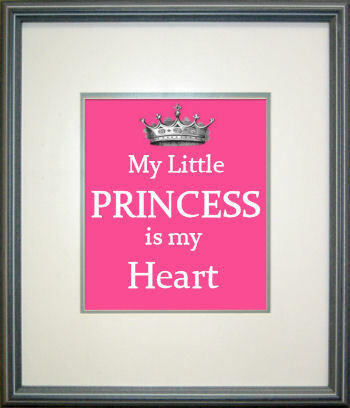 You might design your own princess nursery wall art featuring your favorite saying or quote and frame it yourself. 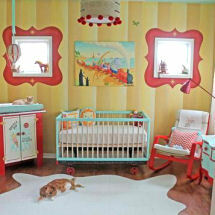 Click below to see the latest vintage theme bedding and nursery decor. Let's take a look at some princess house pictures and get some ideas for creating a baby girl's medieval nursery theme. First order of business is to find the perfect little princess crown crib bedding set for our baby girl’s Camelot. What color is best for our medieval nursery wall? What colors should I use for accents? Should I focus on a particular motif? If so, which one? Where can I find the Disney Princess Bedding for sale? So, now you see the importance of choosing your cribset wisely. Here’s an example of what you might look for in your princess theme bedding. A pretty patchwork set of pink medieval crib bedding set with yellow gold crowns appliqued with jewel tone accents that will set a royal mood for your decorating project. Ok, Rapunzel and Snow White may not have been princesses, but they are famous and of the Medieval period. At least I think so and they were hanging around in their castle towers waiting on their prince to come and rescue them. 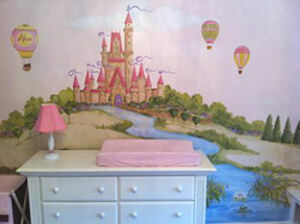 If you wish you can approach the princess theme from the fairy princess angle and create a fairy princess theme room! A set of fairy princess theme bedding would be less about the princess’s castle and her knight in armor and will take more of a fairy garden slant on the decorations. You might want to try painting a castle mural on the nursery wall. This would be fabulous to use as an extra in nursery design ideas for your princess wall decor and you can use it to decorate a young girl’s bedroom, too! Once you take the time to paint a castle in the clouds, you will want to get some decorating mileage out of it! If you aren’t that keen on painting a medieval scene yourself, check out some wall decals or wallies or even a nursery mural kit! Get a crown or castle shaped nursery rug! These handy little decorative items will fill out your princess theme from floor to ceiling! Throw in some hearts and flowers and you’ve got your foundation for the perfect princess theme room! Medieval nursery themes are not just for a princess, they will work for a baby boy’s room as well! You will not want pink as the dominant color in your medieval baby bedding set for your kingdom, but a less elaborate crown or even a knights helmet with a make believe family crest would be so cool! Focus a little more on knights in armor, the horses they ride for the royal joust, a few dragons and a wizard with a long robe, pointed hat and a magic wand and you’ve got a prince themed room for your baby boy! Whether you are creating a princess theme room or a room fit for a prince, there’s enough fantasy to go around! Please make plans to visit Unique Baby Gear Ideas again soon to see more princess baby bedding sets and nursery ideas that you can use to design a pretty room for your tiny princess.